Writer/director Cameron Crowe's hit seriocomic look at the high-pressure business side of pro sports stars Tom Cruise as a top athletic agent who speaks out against greed in sports...and is promptly fired. With only a flamboyant NFL player (Best Supporting Actor Oscar-winner Cuba Gooding, Jr.) left as a client, Cruise tries to rebuild his career while at the same time falling for pretty assistant Renee Zellweger. With Kelly Preston, Bonnie Hunt. 139 min. Widescreen; Soundtracks: English Dolby Digital 5.1, French Dolby Digital Surround, Spanish Dolby Digital Surround; Subtitles: Spanish; interactive menus. 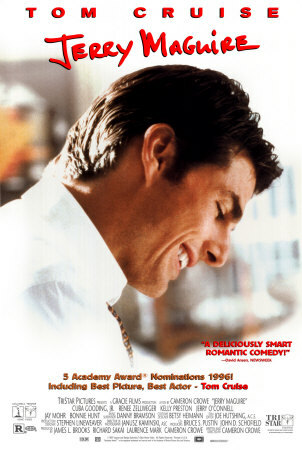 Three-disc set includes "Rudy," "Jerry Maguire" and "Radio."